Hello from the deserts of Arizona! Too hot to cook inside. 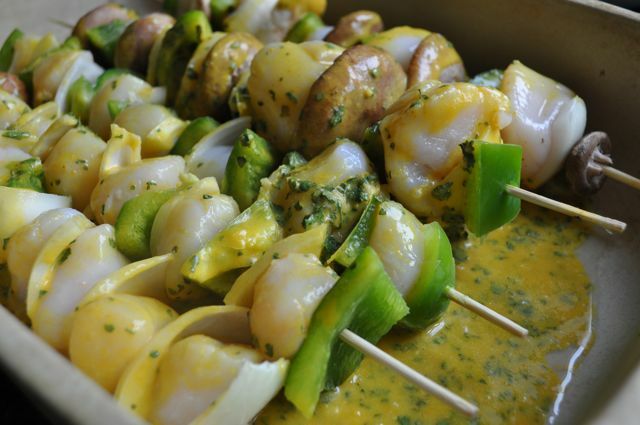 Perfect for grilling kabobs. This is my first time ever cooking kabobs. What took? It was delicioso. Thank you, Heather Rogers for this amazing recipe! 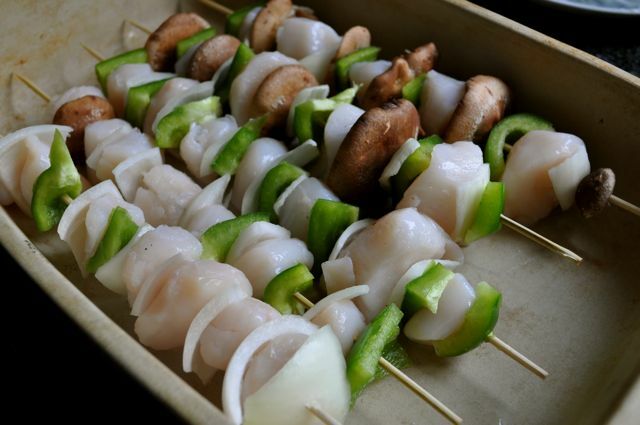 Begin with Scallops, Onion, Green Pepper, and Porcini Mushrooms. And I don’t even love mushrooms, but I loved these. The quandry: Frozen packaged scallops or fresh scallops from the deli? The quandry was the big price difference. I ended up getting half a pound of big, juicy, freshly caught scallops from the deli, and the small, frozen, packaged scallops for the cherubs. The frozen were still tasty. Pour on the easy and delicious Green Velvet Cilantro Sauce..isn’t that a lovely name? The tumeric turned it that golden yellow. Cilantro flecked it green. I love summertime cilantro. Amazing health benefits of the golden tumeric Here and Here. 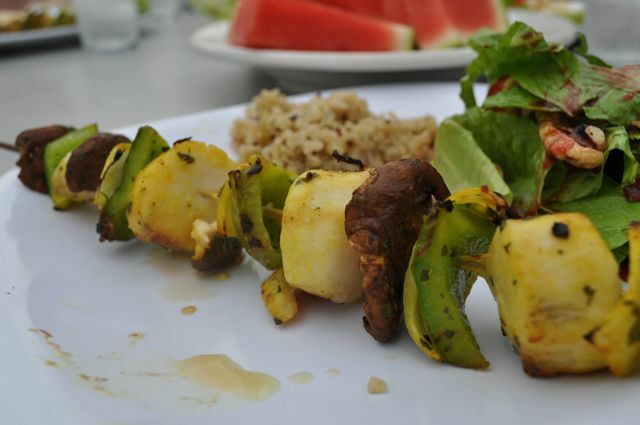 This kabob is brimming with heart healthy goodness, loaded with vitamins and minerals. And of course it tastes wonderful, or we wouldn’t be eating it would we? 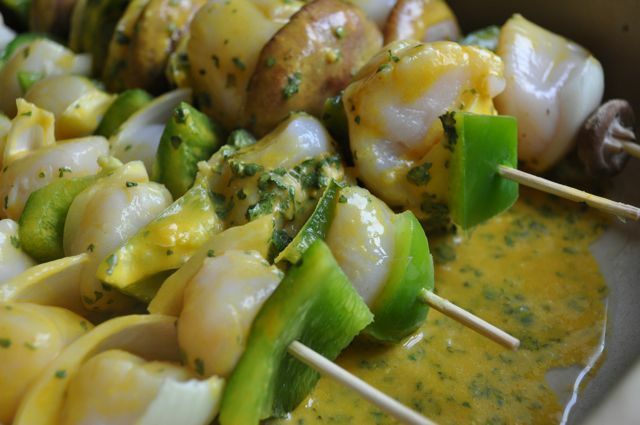 Mmmmm….it was fun to experiment with a fish kabob rather than chicken or steak. Or rabbit or squirrel. Nelson is still setting traps after scout camp; he says rabid squirrel tastes the best. Thank you, scout leader, for such inspiration. The longer the merinade sits, the more flavorful it will be. I just like looking at all the colors. Pour on top of kabobs and merinate. I had an hour, but starting in the morning would be even better. 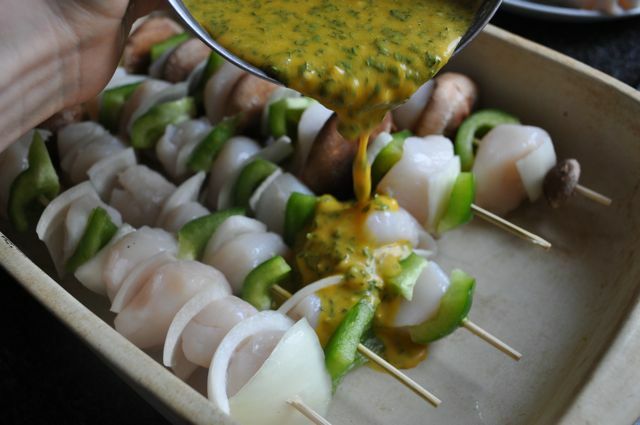 These grilled up nice and fast – about 15-20 minutes, until the scallops were slightly golden, but still soft and juicy. Happy Weekend, and may your grilling be wonderful. 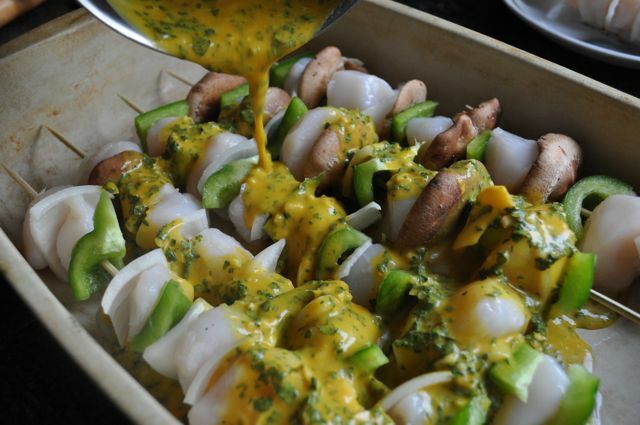 This entry was posted in Recipes, runner food, Weekend Recipe, yum-yum on July 7, 2013 by maisymak. Do you cater cross-country? 😉 These look fantastic! This sounds like me. Saving this for our next BBQ season. PS- just wrote down the sauce recipe to make tonight!